provide students with a rich library of books, from beginning to advanced reading levels, thereby making a wide range of topics accessible to all readers. provide students with regular chunks (at least 15 minutes) of sustained silent reading (SSR) time. It’s the third component – test the heck out of students with online multiple-choice tests – that I find troubling. As to the fourth component – provide students with prizes – I think researchers such as Alfie Kohn have already made a compelling case against reading incentive programs. Accelerated Reader (AR) may be “the most influential reading program in the country” (“If you’re shopping, find the books that work for kids,” December 17) but there is no clear evidence that it works. It fact, it might be harmful. AR has four components: It makes sure children have access to books, provides time to read, quizzes children on what they read with a focus on details, and awards prizes for performance on the quizzes. It is well-established that providing books and time to read are effective, but AR research does not show that the quizzes and prizes are helpful. Studies claiming AR is effective compare AR to doing nothing; gains were probably due to the reading, not the tests and prizes. AR encourages an unnatural form of reading, reading focusing on often irrelevant details in order to pass tests. #4. What are you students saying about AR? A teacher in my district recently shared with me that one of her 4th graders brags about being able to pass an AR quiz just by reading the write-up on the book jacket. 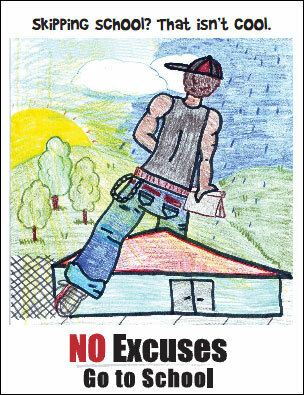 Hmmmm…..In taking a closer look at the winning entries in our district’s No Excuses…Go to School poster contest, I’m thinking this winning entry by a middle school student provides a window into the student perspective. 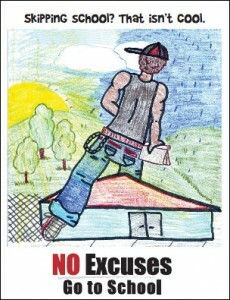 I wish I could see the title of the book the student is gripping as he hops the fence to skip school. What do you bet it’s not on the AR list AND it’s got “the flow” going for this escaping student. I’m sure there’s a 5th question administrators should be asking of AR. If you think of one, please post a comment.